To say we don't deserve to be on a list with many of these breweries is an understatement. That said, we're proud to have been included on this list of amazeballs breweries from Food & Wine that aren't exactly on the beaten path. NEW BEERS / Best of Voting! CLICK HERE TO GET YOUR VOTE ON! It’s that time of the year when VolumeOne opens their reader polls up for voting. Last year we took home the top award for BEST LOCAL BREWERY which stole the crown from a mega brewer's subsidiary brewery located up in Chippewa. Let’s keep that crown and also vote one of our beers for your favorite local beer! The next round of our single Hopped DMT series is... GALAXY! A super tropical hop from down under. Get it in cans while you can. In cans. 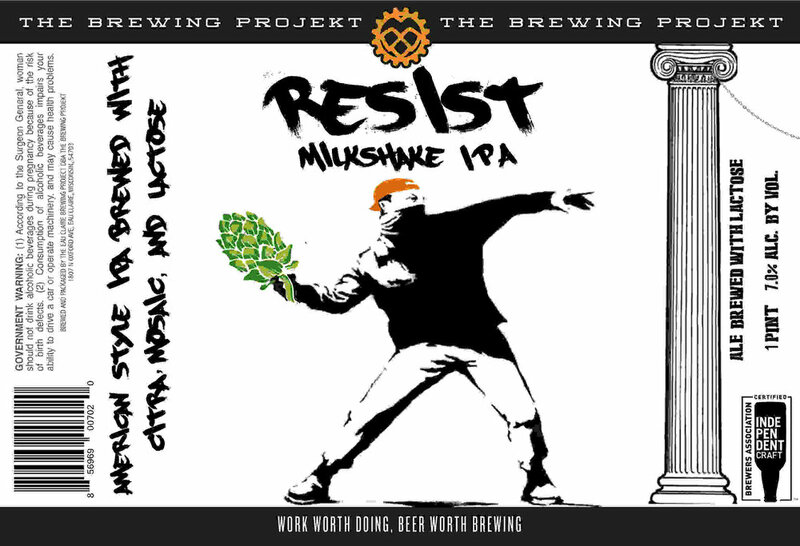 Our first stab at a milk shake IPA brewed with Lactose for a nice smooth body with residual sweetness and hopped with CITRA and MOSAIC! Our super duper single dry hopped Hazy Pale Ale features a boatload of Citra and at a lower gravity you'll be able to crush these suckers all day long. Stay tuned for HUSTLE! As you may have seen, a small group of legislators have decided to take on the cause of modernizing the laws that govern Wisconsin's brewerys, wineries, and distilleries. PLEASE take a moment to reach out to your legislators and the governor and ask them to publicly support "Cheers Wisconsin"/LRB-3614. Don't know who your legislators are? I am contacting you today to ask for your support in modernizing Wisconsin Chapter 125. On Tuesday August 1st several state legislators introduced LRB-3614, which is the first step in a campaign called “Cheers Wisconsin”. Please consider voicing public support and co-sponsoring this bill as well as subsequent bills in the “Cheers Wisconsin” campaign. For too long special interests have worked to enact barriers to entry for Wisconsin’s entrepreneurs in the name of an outdated three-tier system. While the three-tier system has it’s roots in very legitimate concerns coming out of prohibition it, unfortunately, exists today as a means to limit competition in a market that is almost unrecognizable from it’s original intent. The “Cheers Wisconsin” campaign marks the first time in Wisconsin’s history that legislators, regardless of party affiliation, have introduced legislation that looks to modernize Chapter 125. Wisconsin’s small and independent brewers, distillers, and wineries are a great asset to our state’s economy and are a driver of economic growth that is truly home grown. By supporting these family owned businesses we’re fostering entrepreneurs and innovators who chose to open and grow their businesses in our great state. We need not continue to allow antiquated laws to stand in their way. Again, I ask you to support Representative Tauchen’s bill LRB-3614 and the “Cheers Wisconsin” campaign’s efforts to modernize Wisconsin’s Chapter 125 through your public support and co-sponsoring of this bill and future bills. I would also ask that you please respond to my request so I know where you stand on this important issue. Thank you for your time and service to our great state. So, we're heard you. You didn't like the website. So we're going to work on this bad mamajamma and do our damnedest to keep it updated so you know what the heck is going on.